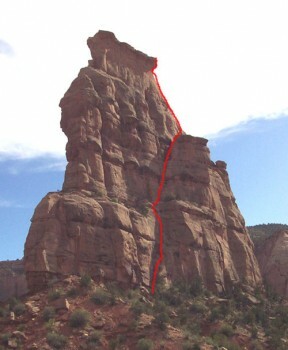 This is the most moderate major tower in this guidebook and probably all the Colorado Plateau. That said, it is not easy and while the protection is good at crux moves, there are often long runouts on easier terrain. The route is moderate for two reasons: First, the climb follows a large ramp and chimney sections (no chimney moves required) and second, whenever the climbing gets steep, there are large drilled pockets for handholds. Each pitch is varied, fun, and manufactured for your climbing comfort. Which SuperTopo guidebooks include a topo for Otto's Route?